Even with their weakest passing offense in years, a defense that struggled at times and little playmakers the Badgers should be happy about their 3rd straight Rose Bowl appearance. Montee Ball is gone and the offensive line took some hits but a fourth straight Rose Bowl isn't completely out of the question. The backfield is still very strong and the aerial attack should improve in big ways. can actually both the ball down the field, with his great arm and is somewhat of a dual threat. Though whoever starts at quarterback they won't through too much even with new coach Gary Andersen replacing Bret Bielema. 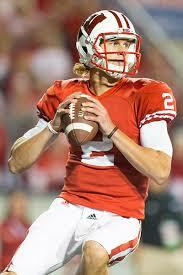 Wisconsin for years has been a power football team that relies on the run and that won't change much with Andersen. Senior James White takes over for Ball after rushing for 806 yards and 12 touchdowns last year. White is a lot like Ball; he is shifty and elusive and is very versatile. Andersen should also give sophomore Melvin Gordon a lot of carries. Gordon, a highly touted recruit, ran for 621 yards in his debut and could be a Heisman candidate in a few years. Receivers: Senior Jared Abbrederis returns after a strong year and will give the Phillips/Stave combo a reliable target. Abbrederis recorded 49 receptions and 837 yards in his junior year, even without a quality quarterback to get passes from. Abrederis isn't necessarily the fastest player on the field but finds ways to get open and has great hands. Sophomore Jordan Frederick returns after a solid debut. Frederick is more dangerous than Abbrederis because he has more speed and is a deep threat. Senior tight end Jacob Pedersen also returns and is one of the nation's best at his position. Pedersen is a receiver, not a blocker, and should be considered as just another receiver. He can find ways to get open and has the advantage in speed over the linebackers that will likely be forced to cover him. If this passing attack will improve the Badgers need little used receivers like Kenzel Doe (121 receiving yards in 2012) and Reggie Love (19 yards) to step up in big ways. Offensive Line: Wisconsin will definitely miss tackle Ricky Wagner and center Travis Frederick but a number of great linemen are ready to step in. Senior guard Ryan Groy returns and should be the anchor of this unit. He'll start at the left guard spot and should play a big part in Wisconsin's dominant ground game. Standing at 6-8, Rob Havenstein should start at the right tackle position and should dominate with his size. The top candidate to replace Frederick will likely be junior Jacob Ninneman but freshman Dan Voltz should also get an opportunity. Another massive linemen, freshman Jack Keeler, will get a chance to challenge for one of the tackle positions. Three-star guard Matt Miller is the future at the guard slot. Defensive Line: Andersen will likely bring in a 3-4 defense that should actually work well with former end David Gilbert moving to the outside linebacker spot. The front three should feature a lot of experience and a number of pass rushers including senior Brendan Kelly who had 5 sacks in 11 games a year ago. Another senior, Pat Muldoon, also returns at the end position and all though his stats may not show he is very productive. With a number of pass rushers making plays on the perimeter the Badgers should rely on senior nose tackle Beau Allen who has proven he can be a run stuffer. Yet another senior, Ethan Hemer, should also get some snaps at the end and he can be a disruptive force with his massive frame. In-state find Chikwe Obasih has the potential to be a star in the future for the Badgers and could be their best pass rusher since J.J. Watt. Linebackers: The return of senior Chris Borland is a huge boost for a Wisconsin team that had a solid rush defense throughout 2012. Borland had 104 tackles despite missing two games last season and has proven that he can read plays well. Borland who stands at 5-11, 242 pounds has the perfect body to make plays from sideline to sideline and he can sneak into holes of the offensive line to make plays in the backfield. The return of the other inside 'backer Ethan Armstrong was also big for the Badgers as he racked up 93 tackles a year ago. Armstrong also has great range and has a nose for the ball and his experience allows him to be the leader of the defense with Borland. Senior Gilbert will likely start at one of the outside linebacker spots after a solid career at end. He has the potential to be a force as the move allows him to roam the field and the line should open up holes for him. The other outside 'backer spot is the big question for this unit. Sophomore Joe Schobert and freshman Vince Biegel will both compete for the job and it is completely possible that hybrid freshman Alec James should also get a chance. Secondary: The Badgers lose effective cornerback Marcus Cromartie to a pretty weak unit in 2012. True to form, the Badgers expect to be psychical even at the cornerback positions where they will rely on some unproven players. Sophomore Darius Hillary has the potential to be a shutdown corner but he struggles to make plays at times. The other cornerback spot is a real question as both Devin Gaulden and Peniel Jean have talent but haven't had the snaps to show it yet. The safety positions have more experience but aren't much better. Senior Dezmen Southward, a senior, had just one interception in all of 2013 but he has the big play potential to increase that number a lot this year. Sophomore Reggie Mitchell will likely end up the start at the free safety position and much like Southward he also has the potential to be a big play threat. The Badgers' staff went down to Florida and managed to land athletic cornerback Sojourn Shelton, a four-star prospect. The No. 10 JUCO safety Donnell Vercher has the talent and smarts to contribute from the start. Although this Badgers team has some significant weaknesses it still has the type of roster to win in the Big Ten. If Stave proves that he can move the ball and the new 3-4 system gets more pressure on opponents the Badgers are a definite contender in the Big Ten.